Posted on Thu, Feb 23, 2012 : 5:59 a.m.
A westbound Amtrak train to Chicago pulls into the Ann Arbor station on Wednesday. In the background is the University of Michigan Hospital, where the mayor and other city officials want to build a new train station on Fuller Road but others prefer keeping the Depot Street site. The University of Michigan's decision to halt plans for a parking structure as part of Fuller Road Station leaves Ann Arbor officials contemplating the proposed transit center's future. Some, including Council Member Mike Anglin and the Huron Valley Group of the Sierra Club, argue the city should shift its attention away from Fuller Road to the existing Amtrak train station on Depot Street and run more buses in and out of that site. "Considering the train comes there only a few times a day, it's an easy place where buses can come and meet them and take the passengers where they need to go," Anglin said. "I think we have a site right now, and therefore why jump and make another site that's unnecessary?" Mayor John Hieftje and other city officials argue a brand-new transit center, including accommodations for buses and trains, in front of the U-M medical complex along Fuller Road still makes sense. Hieftje said it's the perfect location considering 24,000 people a day already visit the U-M medical complex and Depot Street is not a major destination point. "It can serve as a real gateway to the city of Ann Arbor," he said of the Fuller Road site. "The Depot Street station won't work for many reasons. Amtrak is going to outgrow it before long and it'll never work for commuter rail. You can't get buses in there to transport people." Council Member Mike Anglin, D-5th Ward, wants the city to shift its attention away from Fuller Road and focus on the Amtrak station on Depot Street. Hieftje said the City Council will have a more intensive conversation about Fuller Road in the near future as it discusses accepting a $2.8 million federal grant for preliminary work on the project. Anglin, D-5th Ward, stirred up the issue at Tuesday's council meeting when he suggested the city should drop its plans for building a transit center in Fuller Park. "The high-speed rail, which has already been funded from Kalamazoo over toward Chicago, will ultimately come our way," Anglin acknowledged. "And as rails are improved, the fact that we have a train station, I think we ought to use that land for it." Anglin said Amtrak's trains pass through Ann Arbor only a few times a day, and the Depot Street area is not as congested as some might suggest. "It's much easier for buses to just be present when the trains come," he said. "There are a number of people on the trains, and buses going to different destinations makes a lot more sense to me. We can't keep spending as if every idea we have is fundable." Pointing out a new train station would cost millions of dollars, Anglin said the city has greater needs in the police and fire departments, as well as in roads, trees and parks. The local chapter of the Sierra Club has fought to stop the city from building on city parkland along Fuller Road. The group agrees with Anglin that a better location to achieve the city's vision for a multi-modal transit center is at the site of the existing Amtrak station. "Now that the university parking garage portion of the plan has been dropped, we urge the city to take this opportunity to reconsider the potential for upgrading the current Amtrak station and environs," reads a statement released by the group. "This location is still relatively close to the hospital, is closer to downtown, is adjacent to the intersection of the north/south rail line, and is more suited to additional transit-related development." But city officials contend they've looked into that option and — citing logistical challenges and traffic issues — Fuller Road is the better site. Marc Magliari, a Chicago-based spokesman for Amtrak, said station location decisions are driven largely by the communities themselves, with Amtrak and the Michigan Department of Transportation working them and the railroad that owns the tracks. "What is clear in the case of Ann Arbor is our passenger volumes have exceeded the size of the current station and its parking, particularly the difficulty passengers face when using the parking lot on the opposite side of the tracks from the station," Magliari said. Council Member Sabra Briere, D-1st Ward, said at Tuesday's meeting she hopes Anglin will join her on a walk through the area around the current Amtrak site. "Because there are some interesting issues related to infrastructure and the types of infrastructure improvements that would have to happen before we could have buses and cars going in large quantity into that site," she said. 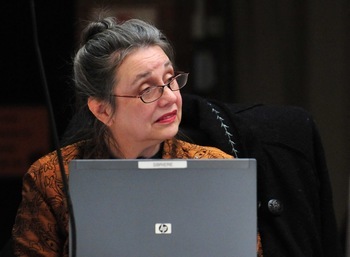 Council Member Sabra Briere said if increased passenger rail service through Ann Arbor happens, the city is going to need to address the logistics of where the station is today. The city is hoping Fuller Road Station can serve as a future gateway for tens of thousands of regular visitors to the city and accommodate the future growth in rail ridership as high-speed rail from Detroit to Chicago and commuter rail from Detroit to Ann Arbor become realities. Briere said if increased passenger rail service through Ann Arbor happens, the city is going to need to address the logistics of where the station is today. She said the city has the choice of thinking about it now or pretending it's not a problem. "There are so many people coming into North Main Street and turning onto Depot that it can back people up three lights," she said. "Depot floods, sometimes over a foot. If we have buses lined up there to pick up passengers from the rail station, it's going to negatively affect the residential nature of that neighborhood and it's going to slow down people even further." Briere said she's supportive of a train station at Fuller Road, but she's happy to wait until there is an increased level of train usage and the tracks are improved, which could take two years. "I have no idea when we'll get increased train traffic, but I do look at the logistics and I don't think Depot can bear a lot of increased passenger use," she said. 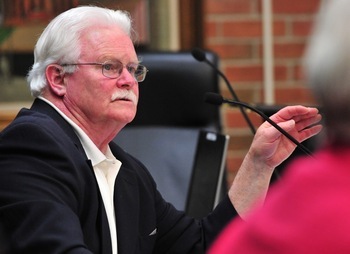 Council Member Tony Derezinski, who is contemplating a run for mayor in two years if Hieftje steps down, said he remains committed to the vision for a transit center on Fuller Road. "I think it's definitely full steam ahead on the project," he said. "The most attractive part is it's being a railroad station and a center of intermodal transportation. It's going to be the main entrance to the community when mass transit really reaches its potential here." Derezinski said the city must push ahead with Fuller Road Station and "take steps now to see the wonderful results down the line." Council Member Jane Lumm, an Independent who represents the 2nd Ward, is asking the city's administration for a full accounting of all Fuller Road Station expenses to date. It's estimated the city has spent hundreds of thousands of dollars on preliminary work for the project and it has undertaken a $1.34 million project to relocate utility lines at the site. 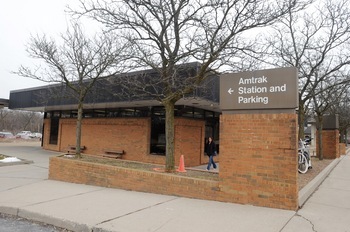 The current Amtrak station in Ann Arbor was built in 1983. "The money has not been wasted at all," Eli Cooper, the city's transportation program manager, told AnnArbor.com in an email, adding his sense is the city will pick up from where it is now — less U-M's interest in a parking garage — and move Fuller Road Station forward. Lumm thinks it would be helpful to "hit the pause button" and have a robust community conversation about the project. She said citizens are asking questions about the status of the next phases, and posing many thoughtful alternatives for consideration. Anglin said the city should be involved in discussions about the future of rail in Ann Arbor, but not building a train station using city dollars. Instead, he said the city should cooperate with Amtrak and the Federal Railroad Administration to talk about the potential on Depot Street. Now that DTE is cleaning up the old MichCon site off Broadway Street near the current Amtrak station, Anglin said, that's all the more reason to look at the area's potential. "If we use the MichCon site, there would be no effect on park land. That would just be an eliminated discussion," he said. "No new construction costs would be related to it since the train is already there on that site. Future train expansion costs would only be incurred when a commuter service line would come in and funding was available." Hieftje said one of the problems with the current Amtrak site and surrounding location is that it's in the floodway, which isn't a good place to make such a major investment. He said he's been working for a long time through a group called The Wolfpack and talking to DTE about the riverfront property Anglin referenced. "If everything works out as planned, that will become a great new riverfront park," he said. "As you know, our most desirable parks are right there next to the river and that would become a new park in the city as soon as the cleanup is fully accomplished." Fri, Feb 24, 2012 : 4:16 p.m.
Fri, Feb 24, 2012 : 1:30 p.m.
Its very sad that our mayor talks about not putting the train station in the floodway but was stopped by citizens and MDEQ at the last minute from putting the homeless shelter in the floodway, at a loss to the city of about $1M in the scraped plan. But he still pressed to have it in the floodplain where it was built and where emergency exits from the building are into the floodway. His logic escapes me. I agree the Fuller Park should not be used for a station. In the current FEMA FIRM this location is in Zone X of the floodplain, a flood hazard zone also. Why is Ann Arbor willing to fund this effort when few if any towns do this, and at a time when we are cutting back on safety services? 'Push the pause button' and lets have a conversation not a back room agreement. Fri, Feb 24, 2012 : 1:23 p.m. I worry when our council hears that Ann Arbor is doing better financially. At this time our tax payers should not have to foot the bill for a new train station . We need to take a better look at who is going to pay for what. Why do we need to rush to make a decision on this one? This is something that we should consider at a reasonable pace and not rush to judgment over. Our council does a great job securing green property outside the city but when it comes to green property within the city the majority of our council seems to take a different look at protecting our parks and golf courses. Fri, Feb 24, 2012 : 3:53 a.m.
Who are the 24,000 people who will ride the train? Are these the same individuals who will need the services of the University of Michigan hospitals? Perhaps these people will not have the health or the stamina to ride a train and take a bus to the hospital for health care. When I am sick, the last thing I would want to do is ride a train to the physician's office. Can you imagine traveling to surgery using a train and returning home on the train? Traveling to chemotheraphy using a train and returning home on the train? Traveling to give birth using a train and then traveling home with your first born? Perhaps it would be better to use the money for taxi services instead of a train. Don't the ill deserve something better than just the hope of train ride to the hospital? Foremost, this is a community first. We need a safe, healthy environment in which to raise our children. We need great schools. We need to make sure all our kids leave Ann Arbor with a high school diploma--one of the best ways to spend our tax dollars . . .giving our kids a future. Check out the graduation rates in our high schools. We can do better. We need parks. In a society of obesity, why is our council talking about buses and trains instead of parks and exercise? Why not spend the money on an affordable city exercise facility for all our Ann Arbor residents????? Why not fix our roads? They are embarrassing. Why not hire more police? There is currently a rash of crime sweeping the city----do we have enough police? Without a safe city, who would want to come to visit and live here? Think Maslow's hierarchy of needs!!!!!! We need elected officials who think first about us, the taxpayers. They have been elected to serve us. Fri, Feb 24, 2012 : 11:39 a.m.
Fri, Feb 24, 2012 : 1:35 a.m. I think what hasn't been covered much is the availability of adjacent development around the station, both to defray construction costs, and to provide a better destination. As I see the options; Fuller Road: 1) Has zero adjacent development except the hospital, and thus isn't an inviting destination (although I heard rumors they want to develop the rest of Fuller Park too.) 2) Can't take avantage of increased tax earnings from higher commercial property values next to the station. 3) Development on the site will be limited - some parking is needed, but any additional height will cast shadows and loom over adjacent parkland, leading to opposition and a fairly limited height. Depot Street: 1) Is next to a small commericial area that could develop into an Ann Arbor Depot Town destination, and is closer to Main Street-- more truly &quot;in the city&quot;. 2) Said adjacent commercial property values would increse due to station proximity. 3) Development could go quite high on the MichCon lot. A 14-ish story building could be put there, housing perhaps offices, hotels, or retail. The income from selling or leasing this space could greatly defray the cost of station construction and/or property purchase. Ideally, a private developer could take on project risk. Not to mention - Depot Street isn't in a park, and the project on Depot could be built in phases as (or &quot;if&quot;, for the skeptics) funding and ridership increase. I totally agree. Rebuild what we already have and not build something else. What we have now works just fine. Glad to hear someone is speaking sense. Thu, Feb 23, 2012 : 10:58 p.m.
Can't remember ever agreeing with the Mayor, but I have to on this one in regard to location. The Depot street area is just nasty. Good point by Ms. Briere. It is rare but in a big downpour that street floods badly. So, yesterday I filled my tank and noted that in one day the price of gasoline increased by $.26. I noticed the price when I drove by the day before but decided not to fill up after hearing on the radio the recent per barrel increase would not be seen at the pumps for a week. Silly me. If gas goes up to what some are predicting, a lot of people will be looking favorably at a train. I want a train with a car where I can store my bicycle: <a href="http://www.terrapass.com/blog/posts/more-room-for-bikes-on-trains" rel='nofollow'>http://www.terrapass.com/blog/posts/more-room-for-bikes-on-trains</a> I think this is a point that has to be considered seriously here. Gas prices are volatile and the February price we see now is a record for this month. So put this off for a couple years and we may all be thinking we should have acted earlier on getting this up and running. I disagree with Stephen Ranzini on a mix of retail and medical offices at Fuller Road site because to put anything other than some retail directed to passengers will draw non passengers requiring much more parking space and consuming more space. Put some small retail for newspapers, magazines, maybe some food to generate some revenue but his idea sounds like turning this into more than a train station. Fri, Feb 24, 2012 : 9:28 a.m.
@Mick52: I agree 100% with what you wrote, except the last paragraph. The merit of my plan is to enable the city to build the new station without spending a penny of city money. Selling the air rights to build a tall building over the Fuller Road Station parking structure would yield a very large amount of money (think $10 million to $20 million) and create a large ratable asset to enhance city tax base (the ultimate project could easily be $100 million in value), if it had a deed restriction that prevented it from being sold to a non-profit without a large property tax &quot;exit tax&quot;. The closest property near a high speed rail train station is by far the most valuable. The current plan contemplates using 100% of that extremely valuable real estate only for - parking cars. Ouch! The $100 million tall building above the high speed rail station could have medical offices and residential condos. You could then add location focused retail on the ground floor (for example, convenience store, pharmacy &amp; coffee shop). With the planned skywalk directly into the hospital from the train station, it would be a quick walk to the main hospital &amp; this would become the premium space for medical office space in the area because of its convenience for the docs (wasting time commuting between the hospital &amp; their medical office is very expensive to them since they can't bill sitting in a car). That means the building could charge premium rental rates per ft2 (which increases the value of the tall building). Also, it would drive ridership on the train for the many people who visit their doctor for follow-up visits to the doctor&quot;s office because of its convenience (just park, ride the train &amp; when you arrive take an elevator up). To do this, the city must design the project &amp; engineer the foundations now in a way to allow for construction of a tall building above the parking structure. You can't do this after the fact except in a very expensive way. Thu, Feb 23, 2012 : 9:47 p.m. The old MichCon site is a brownfield. Why not pave over that land and put a new train station there? I think it would be far less costly to pave over a brownfield than to: A) make a brownfield viable as a park and B) take park land and build a new train station on it. Besides, build a new station on the brownfield and passengers don't have to schlep their luggage over the Broadway Bridge to the existing station. Makes too much sense though. Besides, the cinder block walls left at the MichCon site have become a beautiful repository for &quot;public art&quot;. Thu, Feb 23, 2012 : 11:10 p.m.
More Ann Arbor art? Where? Where? I gotta go see more art!! Not. Thu, Feb 23, 2012 : 9:19 p.m. I don't know how many marked spaces there are in the Amtrak parking lot off Broadway but I can tell you that when I went down there over the New Year's holiday period, I counted 130 cars parked in that lot. Cars were parked every where space could be found and if additional space had been available, even more cars would have parked in that lot. Amtrak also claims to own the 24 hour metered lot on Depot Street, accross from Casey's Tavern, and allows long term parking there with an Amtrak parking pass displayed in the windshield, capicity: 38 spaces. The Amtrak employee lot holds 4 cars and passingers are sometimes allowed to park there with an Amtrak parking pass displayed. 130 + 38 + 4 = 172 maximum spaces controlled by Amtrak available at this time, at this location. Amtrak could fill more parking spaces during peak demand periods than they control now. Thu, Feb 23, 2012 : 11:09 p.m.
Leave it where it is now and build a nice pedestrian bridge with easy access to the parking lot and to a bus lot. Thu, Feb 23, 2012 : 10:02 p.m. I should add that the Amtrak parking is now FREE of charge. If the station is moved to the Fuller Park location, below the UofM hospital and if free parking is provided there, how will the city prevent hospital employees from using that lot ( as they do now ) or will the city charge for parking as a lot under DDA control. Can you afford to leave your car in a city of Ann Arbor parking lot over a weekend now? Would you consider the added cost involved when deciding to drive or take the train to Chicago? Also, a major purpose for developing a transportation center is to encourage development around it. Whatever land there is at Fuller Park is either park land or owned by the University. Thu, Feb 23, 2012 : 9:18 p.m.
Council Member Tony Derezinski said he remains committed to the vision for a transit center on Fuller Road. &quot;I think it's definitely full steam ahead on the project,&quot; he said. &quot;The most attractive part is it's being a railroad station and a center of intermodal transportation. It's going to be the main entrance to the community when mass transit really reaches its potential here.&quot; Those who want to spend millions of dollars on a new station in Fuller Park because they believe that commuter rail and mass transit are coming, really need to tell us WHO is going to run the trains. 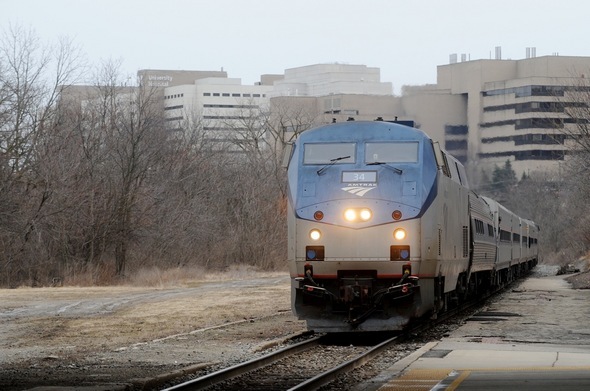 Amtrak does not run commuter lines; the Southeastern Michigan Council of Governments (SEMCOG) has been trying unsuccessfully for a decade to get funding for commuter trains. Even if, by some miracle, SEMCOG got the $70-90 million they need for the project, it would be at least seven years before any commuter service would be operational. (Documentation can be found on the ProtectA2Parks web site - <a href="http://www.protecta2parks.org/home/commuter-rail-in-se-michigan.)" rel='nofollow'>http://www.protecta2parks.org/home/commuter-rail-in-se-michigan. )</a> Of course, it is extremely unlikely that such funding will ever materialize. "What if they built a station and nobody came?" Thu, Feb 23, 2012 : 6:16 p.m. The issues with the Fuller Site (besides the fact that it's parkland and the ongoing parking-related entanglement between the city and the University) is that it is only near the hospital. The hospital is the area's largest employer but in areas with better train service, people take the train for both work and entertainment. There are roughly five major areas of the city where high volumes of people travel in and out of. Central Campus, North Campus/Research Complex, Medical Campus, Athletic Campus/Michigan Stadium and Downtown Ann Arbor. Clearly one station can't serve them all but Fuller serves only one. Additionally, the Fuller road site is bound by parks and offers none of the surrounding economic development benefits that another location would. The best site given the existing infrastructure would be the MichCon site. I would leave the current Amtrak station the way it is until commuter rail or additional rail service is committed to. Then build an intermodal station there. Downtown/Central Campus/Medical Campus are all within walking distance (albeit 3/4-1 mile) but buses would circulate. There is plenty of room to build close to the tracks and make the area along the river all park land. This site could also finally provide the economic development boost to get proposals for Lower Town back on track. The hospital still needs parking, but I would rather see that on Wall St than the Fuller Lot. Thu, Feb 23, 2012 : 6:11 p.m. I'd be happy if our tax dollars were spent on improving OUR ROADS. 1) I think of A2 as &quot;pothole city,&quot; ... I drive a compact, and these roads are killing my vehicle 2) I've been trying to bike to work more, but bicycling on A2 roads is like riding a jackhammer ... even on Huron River Drive, which is supposed to be a bicyclist's dream route 3) if you are walking along the roads after a rain or snow (because I'm trying to take the bus more as well), you should probably wear waterproof clothing--cars can't help it, they WILL splash you because the roads are in such terrible shape Don't even get me started on cut-backs to our police and firefighters...will more people really come to A2 if safety and quality of life is an issue? Thu, Feb 23, 2012 : 5:29 p.m. The city of Chicago should build the train station since they stand to gain the most.....discretionary income from SE Michigan flowing to the windy city. I don't disagree that parking could stand to improve. On the rare occasion i am involved in a train trip to Chicago I arrange a ride from someone or i am the one picking up and dropping off. But my point stands, to the extent that the train in Ann Arbor is mostly about folks going to Chicago to spend money its insane to spend a bunch of money to facilitate that. And I don't buy the notion that there is a demand to take the train the UofM hospital. Sorry I don't believe it. Show me an independent study that says otherwise and I might rethink it. Thu, Feb 23, 2012 : 5:38 p.m.
Well. If they keep the Train Station where it is curently, then they need to enlarge and improve the Amtrak parking lot across the tracks from it. What they have now is a joke. Ever try to take a late afternoon train to Chicago on a Friday? Thu, Feb 23, 2012 : 5:26 p.m.
&quot;Shame on the Huron River Watershed Council (HRWC). What part of your environmental mandate (listed below from your website) includes turning a blind eye to the whole Fuller Rd. development fiasco??? Why are you not joining with the Sierra Club on this issue?&quot; Oh you mean the Chair of that group who helped bring our fair city the GIANT URINAL ART PROJECT? And is in the back pocket of the Mayor? Oh PLEASE! Thu, Feb 23, 2012 : 5:22 p.m.
&quot;Hieftje said it's the perfect location considering 24,000 people a day already visit the U-M medical complex. &quot;It can serve as a real gateway to the city of Ann Arbor,&quot; for starters a vast majority of those 24,000 people will NEVER COME BY TRAIN. As to his phoney &quot;gateway&quot; argument I say %$#&amp;@. All it would be is a gateway to the hospital complex. Thu, Feb 23, 2012 : 4:40 p.m.
Could someone who is supporting the new station tell me when I can start my commute to my job in Dearborn and how much I will have to pay? Will Dearborn build a new train station close to down town Dearborn or expand the bus service? How about other cityes? No ideas?! Then stop using my tax dollars on it!!! You are talking about &quot;commute&quot;, right? For commuters, the public transportation needs to have at minumum a regonal plan; even people can leave and arrive Ann Arbor easily thru public transportation, the other end of the line has to provides similar level of services to make it work. It's like I am building a garage and driveway without knowing where the funding of the house and the road to the house is!!! Crazy stuff!!! Thu, Feb 23, 2012 : 3:59 p.m.
As a newcomer here, maybe I just don't get it. As I read the schedule, the train from A2 to Detroit runs 3 times a day, all at inconvenient or late hours. Maybe I'm unaware of how many people use that train to go elsewhere than Detroit. Enlighten me. Wouldn't it save everyone a lot of money to either (a) do nothing and leave funky the old Depot St. station as it is, or (b) eliminate train service in A2 entirely? Other than as a way to get to Chicago, or as a rest stop between distant cities, what use does it actually have here? Fri, Feb 24, 2012 : 1:38 a.m.
Actually, the Ann Arbor Amtrak station is the most used in Michigan. Thu, Feb 23, 2012 : 2:45 p.m.
How about both. Let's make the Depot Station a real station - and improve the north river area that is underutilized. Some great view properties are there but the area is rundown and surprisingly inactive. I suggest building a multi-story train station with tram station on the second floor. The tram can than initially take you to the fuller station area where they can be dropped off at U-M hospital, a popular place. This &quot;tram&quot; could be a springboard for additional trams, maybe to the downtown core, or the U-M stadium, leveraging the existing AA Railway space and elevate above it. It would be nice if 4th could have a line too linking to the Blake transit center. This should help liven up the northside river area as well as build foundation for future transit. Here's the problem - your idea makes too much sense! Thu, Feb 23, 2012 : 5:14 p.m.
Thu, Feb 23, 2012 : 4:16 p.m.
Thu, Feb 23, 2012 : 2:26 p.m.
As a followup to vaseline's (correct) comment above: From this article: &quot;What is clear in the case of Ann Arbor is our passenger volumes have exceeded the size of the current station and its parking, particularly the difficulty passengers face when using the parking lot on the opposite side of the tracks from the station,&quot; From the 2010 public meeting (you can watch it at <a href="http://a2govtv.pegcentral.com/player.php?video=d8702a5185a6d048ec57970dcfcce765)" rel='nofollow'>http://a2govtv.pegcentral.com/player.php?video=d8702a5185a6d048ec57970dcfcce765)</a>: 52 minutes 45 seconds into the video: need for parking was defined as Amtrak having 75 parking spots now, but they projected to &quot;possibly&quot; need 150 by 20 YEARS from now. They are supporting this tremendous enormous expense for 75 spots over 2 decades? There's a lot more great stuff in there, like the biggest cheerleaders for this project referring to decades-old studies that showed &quot;there was interest&quot; in rail from Lansing to Detroit; that was the big justifier for thinking the new station would turn everyone in Ann Arbor into a train rider, and everyone around Ann Arbor into a train rider that wanted to come here via train. That was it. That was the best they had. You should really watch the whole thing, their answers to some very common sense questions are very enlightening. That's YOUR money they're spending, A2 residents. Thu, Feb 23, 2012 : 3:42 p.m. Funny thing, if you google search ann arbor amtrak parking, you'll find there are 146 spots near the current station. this link: <a href="http://www.marp.org/?p=868" rel='nofollow'>http://www.marp.org/?p=868</a> Then there is this paragraph about parking Ninety five free spaces for long term parking are located on the north side of the tracks, across from the station. This lot is accessible from the Broadway St. bridge by car, and passengers must climb the stairs and use the bridge to cross the tracks to the station side. Unless you are really into fitness, we suggest you drop your luggage off at the station first if you have more then a simple carry on bag. Immediately west of the station is a parking lot of 35 metered spaces. If this lot is full, a little-known but just as convenient lot with 16 more metered spaces is located directly underneath the Broadway St. bridge, between the current Amtrak station and the Gandy Dancer. Both short term lots are accessible from Depot Street, and meters in both lots are generally enforced. Taxis are generally present for all train arrivals. I had to leave several elements of the argument out of my recent opinion piece <a href="http://www.annarbor.com/news/opinion/keep-ann-arbors-train-station-where-it-is-and-drop-the-fuller-road-site/">http://www.annarbor.com/news/opinion/keep-ann-arbors-train-station-where-it-is-and-drop-the-fuller-road-site/</a>. First, the likelihood of a commuter rail system is at least a decade away, not two years away. There is no money and no actual current plans for it. SEMCOG is managing this project and their reports <a href="http://www.semcog.org/AADD.aspx" rel='nofollow'>http://www.semcog.org/AADD.aspx</a> make it clear that the only thing that has happened is that MDOT has used state transportation money to fix up some old rail cars belonging to the mayor's friend Lou Ferris. (Great Lakes Central Railroad owns the cars and Hieftje has identified Ferris, who owns the railroad as a respected partner in commuter rail; see <a href="http://localannarbor.wordpress.com/2011/08/13/wally-hitting-the-wall/)" rel='nofollow'>http://localannarbor.wordpress.com/2011/08/13/wally-hitting-the-wall/)</a> SEMCOG has no money to operate a commuter rail system (it would not be operated through Amtrak). Governor Snyder's transit proposals emphasize the use of Bus Rapid Transit and commuter rail is not part of the mix. Transportation funding at the Federal level is up in the air and may undergo serious changes. The High-Speed Intercity Rail program (HSPIR) has already been killed by Congress. (This was the source of the grant.) The commuter rail has already been denied &quot;New Start&quot; status. There is simply no reason to suppose that a commuter rail system between Detroit and Ann Arbor will materialize in the next 10 years. Rail systems are expensive to operate (in actual budgeted dollars). We can't bear the cost of that with local taxes. Yet the Transit Master Plan now being discussed allocates money to this project - it estimates that our local transit authority would be paying $7.5 million per year by year 30. Is this really where we want to put our local transportation dollars? Thu, Feb 23, 2012 : 2:14 p.m.
As a University of Michigan staff member who employs discount parking in the lot surrounding the area that the new train station would be built on Fuller Road, I was happy that the University chose not to build a parking garage by that site as it would have disrupted employees like myself who have trouble affording the cost that the new lot would have required. I only wish city officials would do the same, for the Fuller station would require tearing down the discount lot. The Amtrak station is good right where it is. Thu, Feb 23, 2012 : 2 p.m. I don't know. I may be crazy, but I think there's a poster who has political aspirations. Anyway what I wanted to say before I read the existing posts....thank you Jane Lumm for some sanity. I think hitting the pause button and getting community input is a great, and for this council, extremely novel idea. This is why I deviated from my history of supporting democrats and voted for you. Thu, Feb 23, 2012 : 1:30 p.m.
Thu, Feb 23, 2012 : 1:26 p.m.
Is this right? 1) Give city-taxpayer-funded parkland away "for free" to federally subsidized Amtrak, for their commercial endeavor. 2) Build a new Amtrak train station "for free" for using city taxpayer funds. 3) Build a new Amtrak parking garage "for free," because train commuters need automobile parking. 4) Purchase the MichCon site at a premium, after expensive toxic cleanup has occurred, and turn it into a park. Use more taxpayer funds, because we really value parks here, and we don't need this land in our tax base. 5) Acquire no ownership interest in the existing Amtrak site. Amtrak continues to use, and profit from their site, in any way they see fit. OK, Now it makes sense. . .
Thu, Feb 23, 2012 : 1:11 p.m. Presently, most who use the train ride it out of town and I doubt that few are commuters. Building an expensive station for such an unknown venture is such a gamble with taxpayer funds for the mayor's dream. Who feels strongly enough about it to risk THEIR own money? Potential UM hospital employees who have bought a rail pass? No The university , with its funds, should first run a shuttle bus system from the existing train station to the hospital to gage demand. Off-setting the inconvenience, these employees would be dropped off at the front door instead of climbing up from the tracks. If the demand is determined to be sufficient, then and only then, should a discussion about a station being relocated be continued. Thu, Feb 23, 2012 : 1:09 p.m. I don't anyone really appreciates what a fully functioning, highly successful rail station actually looks like? Council Member Sabra Briere is right, we need to consider what a dramatic increase in passenger service will look like and I seriously doubt that the site of the current station will be big enough to handle the increased passengers, even with an addition. Fuller Station is the only viable option. Ear, I can't tell if you're being sarcastic: &quot;we need to consider what a dramatic increase in passenger service will look like.&quot; If you're serious, this is one good example of the folly of this project. Considering what things will look like in the future is great. Building a new station in the HOPES that we're right about ASSUMING what things will look like in the future is wrong. Especially when we're in the middle of one of the worst economic disasters of all time. This whole thing is Fire, Aim, Ready. You know what's a great example of unnecessarily spending millions based on grandiose and unjustified assumptions? Ypsi's Water Street. And these people are PUSHING for the Ann Arbor version. Thu, Feb 23, 2012 : 1:08 p.m.
We need Council to be looking at the potential of a new, multi-modal transportation center that will be much more intensively used, not just thinking about how things &quot;are.&quot; It's all about connectivity -- every mode must meet and be convenient: trains, cars, bikes, pedestrians. The current site won't do that and is complicated by the Allen Creek Drain issue. Thu, Feb 23, 2012 : 12:51 p.m.
We need a better train station. Rail traffic is and will continue to pick up, thanks to all the improvements being made on the Detroit to Chicago line. Both the Depot Street and the Fuller Road sites have their merits. Depot is closer to downtown. Fuller is closer to the hospital and university bus routes (as well as any future North-South connector linking the various campuses. If the last comes to pass, probably at U of M's expense, then Fuller might actually be less walking to downtown. Both Depot and Fuller Road will cost the city some money, but much of the money is likely to come from the feds either way. We also don't know which will cost more or if the cost difference will be significant. I still haven't heard an explanation of the difference between the requirement of the voters to approve the sale of *park land* and the zoning of the Fuller Road site as *public land*, which includes both park land and city-owned transportation facilities. It's not obvious whether a referendum is needed or not, legally. All that said, assuming the MichCon site is cleaned up, I would personally prefer a train station on the Fuller Road site (farther from the river) and a park on the MichCon site (adjacent to the river) then the other way around. As it is, the current strip of park land is pretty uninviting ... sandwiched between Fuller Road and the train tracks, no trees, etc. The MichCon site has the potential to be beautiful. Thu, Feb 23, 2012 : 3:41 p.m.
That's a reasonable question to pose. Personally, I doubt you could fit a larger station, more parking, and good integration with the city's transportation network (e.g. bus loading zone) all on the south side of the tracks. I think putting anything on the north side of the tracks is awkward and should be avoided. Thu, Feb 23, 2012 : 2:51 p.m. It's not an either or scenerio for the Michcon site. There is plenty of room to accommodate both a park and an expanded train station. Thu, Feb 23, 2012 : 12:35 p.m.
Thu, Feb 23, 2012 : 7:25 p.m.
Thu, Feb 23, 2012 : 12:23 p.m.
Upgrade the current site. It could easily be connected to the hospital and elsewhere if/when commuter service happens. The fuller road site makes little sense, since it will never be a neighborhood area, whereas moving the current Depot Street location could change that area of town dramatically, in a less than positive way. Renovating the depot street site could be a step toward making this already interesting (near the river, old buildings, parks, etc) part of Ann Arbor even more interesting, where as fuller road, with the hospital, wide road, etc. will always be kind of blah and boring. Visitors will feel like they are someplace special when entering the city in the Depot Street/kerrytown area. Thu, Feb 23, 2012 : 4:08 p.m.
Thu, Feb 23, 2012 : 2:48 p.m.
Thu, Feb 23, 2012 : 11:57 a.m.
And what's this all about: &quot;If everything works out as planned, that will become a great new riverfront park,&quot; he said. &quot;As you know, our most desirable parks are right there next to the river and that would become a new park in the city as soon as the cleanup is fully accomplished.&quot; So let me get this straight; turn the vacant lot next to the EXISTING train station INTO a park, and turn land designated as park land into a NEW train station. Is everyone reading the same thing I am? I feel like I'm taking crazy pills! Thu, Feb 23, 2012 : 1:18 p.m.
Don't forget, this paved-over parking lot next to the existing station is covering serious pollution issues, next to the Huron River. To make it into park will be difficult. Keeping it covered makes sense while keeping the existing park virgin land also makes sense. In other cities, simple pedestrian crossings across the tracks, complete with a gate and flashing lights, allow people easy access instead of having to climb up stairs to the bridge and then back down. &quot;...We can't keep spending as if every idea we have is fundable.&quot;-Mike Anglin That quote should be on the interior walls of city hall. Thu, Feb 23, 2012 : 11:56 a.m.
Citizens of Ann Arbor, please take careful note of the words frequently used by proponents of this project when they continue cheerleading for it: HOPE, as in &quot;we HOPE this can serve as a future gateway...&quot;, IF, as in &quot;IF increased passenger rail service.&quot; Don't forget, funding for this was TURNED DOWN, due to no justification and lack of ridership to make it feasible. They decided to do it as a &quot;Proof Project,&quot; meaning everyone knew there was no justification, had been told so, and they decided to do it anyway. There is no current justification! It's all IN CASE thousands upon thousands of people suddenly get on the Rail Bandwagon. How can they get away with continuing to talk about this when they can't point to any real justification? If I went to a bank asking for money for a business idea and cited nothing but hope and assumptions, I wouldn't be taken seriously. If I had already spent millions of dollars and asked for MORE, I'd probably be in court for misuse of funds and willful deception/fraud. Now they're using the &quot;flood plain&quot; excuse to say they shouldn't renovate/expand the existing station? Then why make it a park? Won't that flood too? Is the cost of making the station resistant to flood more than building a new one? These people OWE us the millions of dollars they ALREADY spent! They owe us that money BACK! Does everyone reading this know where the EXISTING train station is? You should really go look at it from the bridge; it is practically ON that enormous vacant lot. I mean, it's right there butted up against the property line of this vast vacant space, which is CLOSER to downtown than the hospital, and they keep going on and on about a NEW train station? Come on, people. Thu, Feb 23, 2012 : 11:55 a.m. Upgrading the Amtrak station would be very shortsighted. Why upgrade a federally funded facility, when the city can build a new train station (woo-woo) on free parkland, using proceeds of uber-surplus local taxes. We applaud city government's vision of its expansion in providing federal-fund-level service and infrastructure to local residents. We also look forward to the city's expanded role in providing Medicare and Social Security benefits from local funding, as well. It's just a rumor, but we hear the city will be unveiling an early retirement program for its residents, matching that of city employees: Soon we will all be earning more per year, in retirement perpetuity, than we do while working! You forgot to mention the plan for the Recycle trucks to start delivering our mail too. They just have to finalize the technology to attach the smaller arms to the trucks. Thu, Feb 23, 2012 : 11:41 a.m.
What are they thinking??? Really, 24,000 people plan to take the train? Are they kidding?? This is not Europe... Keep and modify the existing site, there is NO NEED TO SPEND MILLIONS on a new station when the city has drastically cut other services! Do they not know that the current station is only what, 1/4 mile from the Hospital?? And closer to downtown. They mention higher traffic on Depot, what about higher traffic on Fuller/Maiden if they move the station there? Have any of them actually ever driven Fuller in the morning or afternoon during hospital rush-hour? Hey major and city council, STOP trying to put more feathers in your hats at our expense!! Thu, Feb 23, 2012 : 1:28 p.m.
&quot;Really, 24,000 people plan to take the train? Are they kidding?? &quot; You say that now, but after they've turned every street into a bike/bus path it will probably seem to make sense. Thu, Feb 23, 2012 : 12:25 p.m.
0.7 WHOLE miles? What about current vs. proposed to downtown? Its an easy walk, my wife walks part of that route every day on her way to work. Im just tired of this city wasting my money on things that really arent going to change much other than cost tax payers more money. having a new train station is not going to increase the number of people going to the hopsital or downtown. Thu, Feb 23, 2012 : 12:04 p.m. The current station is 0.7 miles from the hospital complex according to Google maps, but an even longer walk or drive currently, because there is not a walking paths along the tracks, which is the most direct and shortest way to get from the current station to the proposed site adjacent to the main hospital. Thu, Feb 23, 2012 : 11:36 a.m. I agree with our Mayor, Sabra and Tony D., real estate is all about three things: location, location and location. The best site for a train station is where the most number of people are commuting on a daily basis, and that is adjacent to the U-M Hospitals, by far the largest employer in our community and it's economic engine. A site within quick walking distance to the hospital complex would be the best location and attract the most train riders for both high speed rail and commuter rail. This superior location will also allow more intense use of the site with a mix of retail and medical offices, something that wouldn't be economically viable at Depot Street, and enable the city to build the train station without *any* local taxpayer funds by selling the development rights for the on site commercial real estate uses. This will also increase the tax base of the city. The existing low traffic site with free parking is contrary to the idea that the best site is the highest traffic location. A walking path from the old station to the new along the tracks, but not too close, would allow the existing free parking to be used by those who don't want to pay for parking or who are taking a long trip out of town by rail. Now having said that, the Fuller Road project ought to go to a vote of the citizens because no one can assert with a straight face that they will spend $121 million building it &amp; that it will ever be parkland again! Personally I support the project in concept but NOT if the voters don't approve it first. If it's a project with merit, sell the citizens on that &amp; if you can't convince the citizens, respect the democratic process and move on to other topics. Fri, Feb 24, 2012 : 9:32 a.m.
More details on my plan: The merit of my plan is to enable the city to build the new station without spending a penny of city money. Selling the air rights to build a tall building over the Fuller Road Station parking structure would yield a very large amount of money (think $10 million to $20 million) and create a large ratable asset to enhance city tax base (the ultimate project could easily be $100 million in value), if it had a deed restriction that prevented it from being sold to a non-profit without a large property tax &quot;exit tax&quot;. The closest property near a high speed rail train station is by far the most valuable. The current plan contemplates using 100% of that extremely valuable real estate only for - parking cars. Ouch! The $100 million tall building above the high speed rail station could have medical offices and residential condos. You could then add location focused retail on the ground floor (for example, convenience store, pharmacy &amp; coffee shop). With the planned skywalk directly into the hospital from the train station, it would be a quick walk to the main hospital &amp; this would become the premium space for medical office space in the area because of its convenience for the docs (wasting time commuting between the hospital &amp; their medical office is very expensive to them since they can't bill sitting in a car). That means the building could charge premium rental rates per ft2 (which increases the value of the tall building). Also, it would drive ridership on the train for the many people who visit their doctor for follow-up visits to the doctor&quot;s office because of its convenience (just park, ride the train &amp; when you arrive take an elevator up). To do this, the city must design the project &amp; engineer the foundations now in a way to allow for construction of a tall building above the parking structure. You can't do this after the fact except in a very expensive way. Thu, Feb 23, 2012 : 5:30 p.m.
@Jim Osborn &amp; @blahblahbalh: My point is that if the new station in the best location is FREE in that it costs the city nothing, and the entire tab is picked up by federal funds and the private development of a medical office building and some retail, and that actually would then increase the city's tax base, why not do it? I get that the commuter train isn't yet funded, but it will be more likely to be funded if the station is at the U-M health system and not a bus ride or 12 minute walk away. The more convenient the location of the station for people walking to work at U-M health system, the more riders would be expected for the commuter rail, and the more likely the commuter rail would be funded. What is missing in all this discussion is that railroads can be a profitable business. For example, the Chicago to Detroit &quot;higher speed&quot; train will make a profit each year. Having a commuter rail line would be of great long term benefit to Ann Arbor; let's set the base for it in a way that doesn't cost the citizens a penny. @Jim: until commuter rail is a reality, no busses are needed. @blahblahblah: People can choose if they want free parking by walking and lugging their luggage, or to pay for the convenience of parking in a structure close by. Again, with *my* plan, there is zero cost to the taxpayers. Thu, Feb 23, 2012 : 2:42 p.m. 1.) You mention that, &quot;The best site for a train station is where the most number of people are commuting on a daily basis....&quot;. You are talking about car and bus commuters, not train commuters. Presently there is no funding source (county, state, or federal) for adding a commuter train service. Allocating this much time and financial resources to Fuller Rd., for something that may or may not happen (commuter train service) is completely irresponsible given the other funding priorities of the city. 2.) You mention, &quot;The existing low traffic site with free parking is contrary to the idea that the best site is the highest traffic location....&quot; Current Amtrak riders base part of their purchase decision on the cost of the ticket. If you start charging Amtrak riders for parking at the new station, how will that impact their decision and Amtrak's ridership numbers? If price is an issue for some of these riders, how many will be willing to lug a suitcase .7 miles down a path in your scenerio for maintaining a free parking option? Thu, Feb 23, 2012 : 1:06 p.m. The university , with its funds, should first run a shuttle bus system from the existing train station to the hospital to gage demand. Off-setting the inconvenience, these employees would be dropped off at the front door instead of climbing up from the tracks. If the demand is determined to be sufficient, then and only then, should a discussion about a station being relocated be continued.